The political climate is ripe for Israel to achieve, in only a matter of months, victories it would once have only dreamed of attaining over a number of decades. The primary reason for this? Donald Trump. All of the above is contrary to international law and longstanding international consensus. The international community’s long-time position has called for a two-state solution with agreed land swaps, Jerusalem as a shared capital, and a “just settlement” of the Palestinian refugee problem based on UN Resolution 194. Trump’s key advisers, his son-in-law Jared Kushner and lawyer Jason Greenblatt, have collected thousands of air miles on trips to the region, mostly to Israel and Palestine – but also to key Arab states, including Saudi Arabia and the United Arab Emirates. Visits to Palestine were a smokescreen. It appears that instead of working on a just peace deal, Trump’s team was working on ways to implement, one step at a time, Netanyahu’s vision for “peace”. A crucial prerequisite was to convince key Gulf states that to secure US support against the Iranian threat, they had to befriend or deepen their friendship with Netanyahu. Egypt, Saudi Arabia and the UAE obliged. While the two Gulf states publicly distanced themselves from any dialogue with Israel, clandestine engagements were taking place – facilitated, it seems, by Kushner. Far from the Palestinian issue remaining front and centre of the Arab world’s agenda, Trump’s team managed to convince them that it was an impediment to their plans. 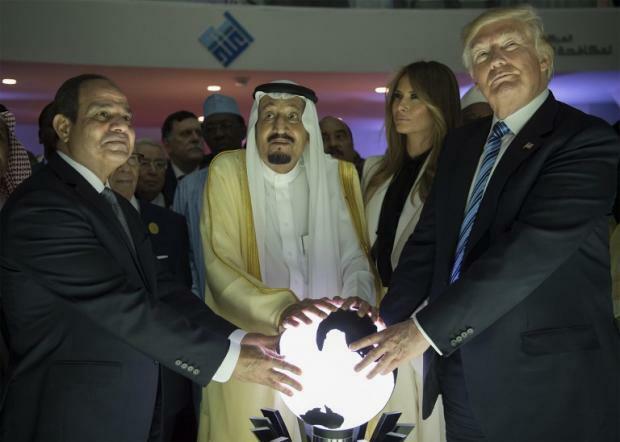 They began to deliver for Trump and Netanyahu within months of the American president’s visit to Saudi Arabia, which was about telling the Arab and Muslim world that he was boss. The chequebooks were out, with billions promised on the spot. Shortly after Lebanese Prime Minister Saad Hariri was summoned to Riyadh, Palestinian President Mahmoud Abbas went there too, to be told to accept Trump’s deal. The Arab regimes also acceded to Trump’s demand that they contain the anger of the Arab street when he announced his decision to recognise Jerusalem as Israel’s capital and to move the US embassy there. Again, they obliged. Yes, there were demonstrations, but there was no significant individual or collective action either by the Arab or Muslim world. “The sky’s still up there. It hasn’t fallen,” beamed Nikki Haley, US representative to the UN. Even when the move coincided with Israel’s 70th anniversary of what it calls its independence – which the Palestinians call the Nakba – and when more than 60 Palestinians were killed by Israeli forces in Gaza, Arab leaders were silent save for cursory condemnations. Guatemala and Honduras followed the US lead, as was expected – and again, not a whisper from the Palestinian people’s historical backbone. The UK and most EU states took what appeared to be a principled stand and boycotted – though they would not describe it as that – the opening of the US embassy. But that stance turned out to be only symbolic, as the UK’s Foreign Office confirmed that British officials would meet their US counterparts in the embassy. While the EU has not officially announced its stance on using the embassy, it would be surprising to see it break away and stand up to the US. Netanyahu can tick off one of the main goals he wanted to achieve, and which Trump has delivered: US recognition of Jerusalem as Israel’s capital. He can mark as a “work in progress” the elimination of Palestinian refugees’ right of return, which Trump is attacking through the defunding of UNRWA, the UN agency for Palestinian refugees. In US ambassador David Friedman, Israel has an ally on the ground. He is working hard to erase the term “occupation” from the State Department’s vocabulary, claiming that settlements amount to less than two percent of the West Bank. It seems that no one in the administration sees these settlements as illegal; Greenblatt believes they are not an obstacle to peace. In recognising Jerusalem as Israel’s capital, Trump gave substantial weight to facts on the ground, and almost no weight to international law. This is music to the ears of Israeli politicians, for whom international law is an inconvenience. With a US president prepared to ignore the law and longstanding agreements, Israeli politicians are pushing ahead with new demands to recognise more facts on the ground. They appear to be in a race against time to extract as much as they can while Trump and his pro-Israel team are in office. Next on the list of demands is US recognition of Israeli sovereignty over the illegally occupied Golan Heights. If all that was not enough, perhaps the biggest prize would be recognition of Israeli sovereignty over al-Aqsa Mosque and US support for the building of a Jewish temple on the site. A stake has been placed in the ground, with the image of a beaming Freidman being presented with a poster showing the compound with a Jewish temple in place of the Dome of the Rock. While the US embassy dismissed the significance of the image, Friedman’s record thus far has been staunchly pro-Israel and unconventional to say the least. Faced with all this and an ailing president devoid of any meaningful strategy, what are Palestinians to do? The Palestinian Authority could take former US Secretary of State John Kerry’s advice to “hold on and be strong”, and not yield to Trump’s demands. They could finally begin the process of bringing Israeli leaders to account for crimes committed against Palestinians through the International Criminal Court, which would take time, and might well not end in success. They could also escalate their non-violent resistance, taking encouragement from the Great March of Return. The most troubling facts on the ground for Israel, however, are the Palestinians – every one of the six million who remain in historic Palestine, plus the collective memory and attachment of the other six million in the diaspora. It may feel it is winning with Trump’s support, but it is losing the demography. Unlike Israeli leaders, I see human beings as individuals, not numbers in a political game. However, in the absence of justice for Palestinians through traditional peaceful means, perhaps their numbers in historic Palestine constitute a winning card. How about a national Palestinian strategy for strengthening their hand with more babies? More demographic facts on the ground will eventually “trump” Israel and Trump’s recognition of Israeli facts on the ground.